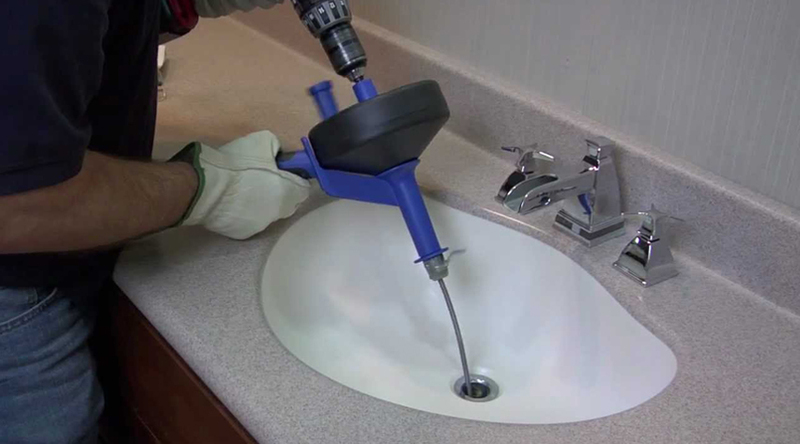 There are multiple ways to clean a drain, snaking being one of the more popular methods. Plumbing snakes can be purchased at your local hardware store, but the ones used by professional contractors like Brothers are significantly more durable and reliable when it comes to clearing clogs. Simple in design and function, the device consists of a long, flexible body that is outfitted with multiple ridges. As the snake is manually fed into the sewer line from the base of the drain, it simultaneously breaks into and hooks onto debris. After the snake has been fully inserted, it is subsequently pulled out in a rotating motion. With it typically comes a heap of hair, gunk, and other buildup. Depending on the extent of the clog, sometimes it only takes one pass to free the blockage and return the drain to its normal condition. The more severe the build up, the more times the snake will need to be used. At Brothers, we have the skills and experience needed to break away even the most formidable of drain clogs. Part of this is knowing what tools to use, and the other part is knowing how to use them. Instead of re-inserting the snake in the same spot on the drain, our technicians strategically place the device at various locations and angles to ensure every bit of debris is removed. If these attempts do not fix the problem, our crew knows when and how to bust out the heavy artillery. When snaking fails, we turn to our trusted augers to finish the job. Sometimes referred synonymously, an auger is a mechanically-fed metal tube that forces debris out of sewer lines; it is essentially the upgraded version of a snake, one with greater cleaning capabilities. Brothers’ commercial-grade augers have the ability to feed lines upwards of a few hundred feet if need be, although this rarely needs to be done. The power of snakes and augers lie in their multidimensional functions; blockages are either pushed through the line, dissolved by the rotating tube, or pulled out of the pipe altogether by the hooked edges. Regardless of how these devices do their job; the point is your residential and commercial clogs stand no chance against a trained Brothers technician and his tools! Clogs can form for a number of reasons (like buildup over time, accidental flushing of non-biodegradable objects, and other factors), and they can cause considerable damage if left untouched. Never neglect your plumbing system if you suspect it might have a problem. Call the professionals at Brothers Plumbing to inquire about our drain snaking services, and how they can help improve your bottom line. We look forward to speaking with you, and are available 7-7-7 for your added convenience!